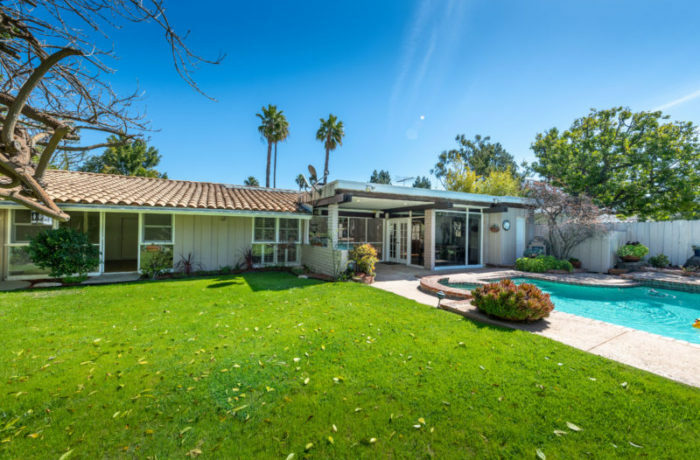 Offered for Lease for $7,900 per month | Private Mid-Century Ed Fickett Bel Air 3 bed, 4.5 bath plus maid’s home. Vaulted ceilings, exposed beams, wood paneling and skylights add character to this Bel Air Hills home. Oversize living room with sleek fireplace, wall to wall windows overlooking tranquil backyard. Attached secondary dining area, adjacent bar and powder room. Formal dining room with enclosed atrium opens to kitchen with one accent stone countertop complimenting granite countertops throughout. Maid’s suite with bath off kitchen for privacy. Three beds with vaulted ceilings on other side of the house. Master en-suite with travertine and dual vanities. Two additional beds share a full bath with tub and dual vanities. Backyard oasis with large grassy area, covered patio, sparkling heated pool, spa and outdoor bathroom. Canyon views, wood floors, Central AC/Heat, 2-car attached garage and laundry room with washer/dryer. Located in the acclaimed Roscomare Road school district. Easy access to Sunset and Mulholland.